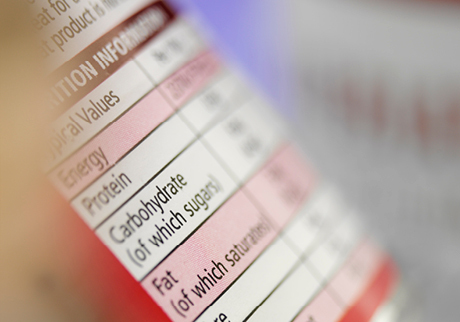 Use the nutrition facts table along with any additional health claims to make informed choices. And because serving size information is standardized throughout the food industry, you can compare between brands too. Many people eat more than the recommended serving. Check the amount to make sure you're exercising portion control. Dependent on age and activity level: men need on average 1800-2400 calories per day and women need 1500-1800 per day. Go low more often. Remember, if you're going to eat double the amount of food, that's double the amount of fat. If you are choosing products that contain fat, make sure you choose healthier fats like polyunsaturates (especially Omega-6 and Omega-3 polyunsaturates) and mono-unsaturates more often than saturated fats and trans fats. Anything that ends in ''ose'' (like sucrose, glucose or lactose) is a sugar as well as molasses and corn syrup. Look for approximately 8 g of sugar or less per serving. You need 25-35 g a day so look for breads and cereals that are high in fibre. When you first increase fibre, do it slowly and remember to increase water intake to the recommended 8 glasses a day and exercise as well. Almost all foods contain sodium as it adds flavour and helps preserve food. Many processed foods contain greater amounts so take care to limit your daily intake to the recommended 2300 mg a day. In Canada, ingredients are listed in descending order by weight (highest to lowest). Be cautious of where fat and sugar fall on the list! Use this to determine if a food has a little, or a lot of a particular nutrient.